Never let it be said that director Matthew Vaughn doesn't strive for authenticity in his films. 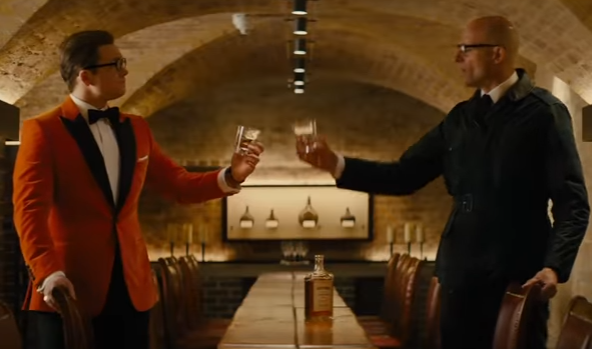 A new featurette from 20th Century Fox for Kingsman: The Golden Circle has been released about the creation of a real life bourbon for the film from Old Forester. The distiller will introduce "Old Forester Statesman" to coincide with the films' Statesman, the American "cousin" to the British Kingsman, who use a distillery as a cover for their spy operations. The American spies are played by Jeff Bridges and Channing Tatum. The video features insight from Vaughn himself along with comments from the distillers as well. Those scenes are intercut with footage from the movie. Old Forester Statesman will be available to drink this August. Old Forester is introducing a new straight bourbon whiskey - named Old Forester Statesman. It will debut in the upcoming film Kingsman: The Golden Circle in theaters September 22 and will be available to drink this August.